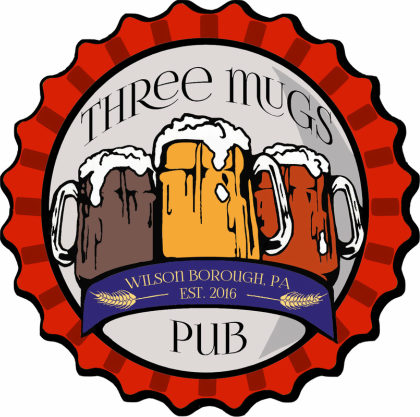 Three Mugs Pub, formerly Shruty's Pub, was established in 2016. Located in Wilson Borough, PA, this hometown pub strives on putting out Quality Food and Quality Service. Stop by for a pint of one of our ever changing 12 beers on draft, choose from over 50 domestic, imported and craft bottles or try one of our delicious homemade cocktails! Come join us for lunch or dinner and enjoy one of our many Appetizers, Entrees and Hand Helds that use all natural ingredients, including locally raised beef from our friends at Koehler Farms. Sit back, relax and feel at home with a seat at the bar, dining room or our outdoor patio. At Three Mugs Pub, we want to make sure each experience you have with us is great one.